The Sayings of Discipleship: In this parable, 'a large crowd' comes before Jesus. The gematria diagram reveals the crowd contains four key men. Jesus then talks to them one by one. The diagram shows the first man can not "hate" his his father, mother, wife, children, brothers, and sisters. The word hate actually means the man must choose or prefer Jesus over his family members. Jesus tells him that if he can not do that, then he can not be his disciple. 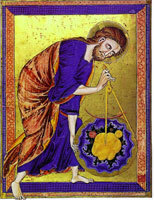 Jesus tells the second man to carry his own cross behind Jesus, meaning to follow him. Jesus tells him that if he can't do this, meaning he can't accept persecution, then he also can not be his disciple. 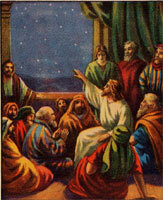 Jesus tells the third man a parable about a man who wants to build a tower. That man must compute the cost to build the tower. But that man is not able to finish the job because he didn't compute the cost of building a good foundation. The man became afraid of being ridiculed for not finishing the job, for not being strong enough to build his foundation. This is a metaphor for what it will cost a man to have faith in Jesus when people begin to make fun of him for believing in Jesus. If this man cannot accept ridicule then he can not be a disciple of Jesus. The fourth man is a king who might have to go to war against another king who commands a much larger force. The weaker king then sues for peace. He is not willing to become a martyr for his faith in Jesus. This parable was probably a metaphor for anyone who refused to make a small sacrifice to worship the Roman emperor upon pain of death. Anyone who sued for peace to Caesar could not be a disciple of Jesus. This parable contains 9 verses, 28 phrases, 170 Greek words translated into literal English, not the paraphrase translations you see in most bibles today, resulting in 22 amazing gematria diagrams. You need to know the key gematria words to solve this puzzle. The Greek gospel text for this story was filled with drawing instructions for each gematria diagram. This gematria parable will stun you. Setting: a crowd coming before Jesus in a kingdom. The Characters: Jesus, a large crowd, four key men from the crowd, a disciple of Jesus, a father, mother, wife, children, brothers, sisters, two kings, an embassy of ambassadors. The Objects in the parable: a cross, a tower, a foundation, life, two armies, all possessions owned by each of the key men.